Presented in the popular Cambridge Texts format are three early Platonic dialogues in a new English translation by Tom Griffith that combines elegance, accuracy, freshness and fluency. Together they offer strikingly varied examples of Plato's critical encounter with the culture and politics of fifth and fourth century Athens. Nowhere does he engage more sharply and vigorously with the presuppositions of democracy. 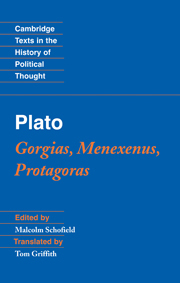 The Gorgias is a long and impassioned confrontation between Socrates and a succession of increasingly heated interlocutors about political rhetoric as an instrument of political power. The short Menexenus contains a pastiche of celebratory public oratory, illustrating its self-delusions. In the Protagoras, another important contribution to moral and political philosophy in its own right, Socrates takes on leading intellectuals (the 'sophists') of the later fifth century BC and their pretensions to knowledge. The dialogues are introduced and annotated by Malcolm Schofield, a leading authority on ancient Greek political philosophy. “This text is perfect for political theory or intellectual history courses at any post-secondary level; nor would it be irrelevant for a philosophy class with supplementary discussion or reading. 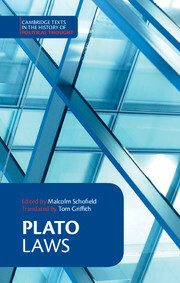 The translation is both fully pleasurable to read and true to Plato’s vernacular and dramatic intentions; the introduction is clear-eyed, smart, free of dogma, and non-didactic; and the format and apparatus provide every kind of help to be hoped for from a non-commentary. 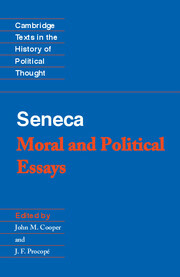 It is refreshingly oriented away from establishing or asserting Plato’s views about politics, justice, democracy, or some factitious version of ‘rhetoric.’ The combination of three texts makes particular pedagogical sense, and for such a combination this edition wins out over alternative competing versions. Malcolm Schofield is Professor of Ancient Philosophy at the University of Cambridge and a Fellow of St John's College. 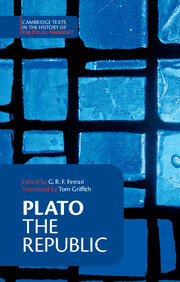 Tom Griffith has also translated Plato's The Republic, Symposium, Euthyphro, Apology, Crito, Phaedo, and Phaedrus.